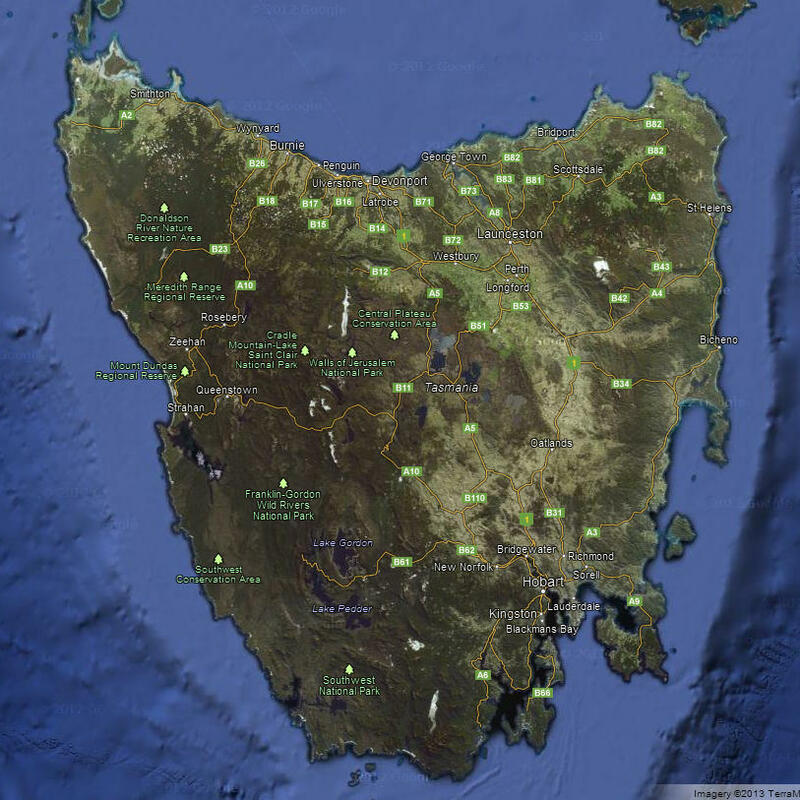 Tom Ellison rightly pointed out that the Savage River Mine is a significant item on the landscape of western Tasmania. Few mines stand out like this one does. 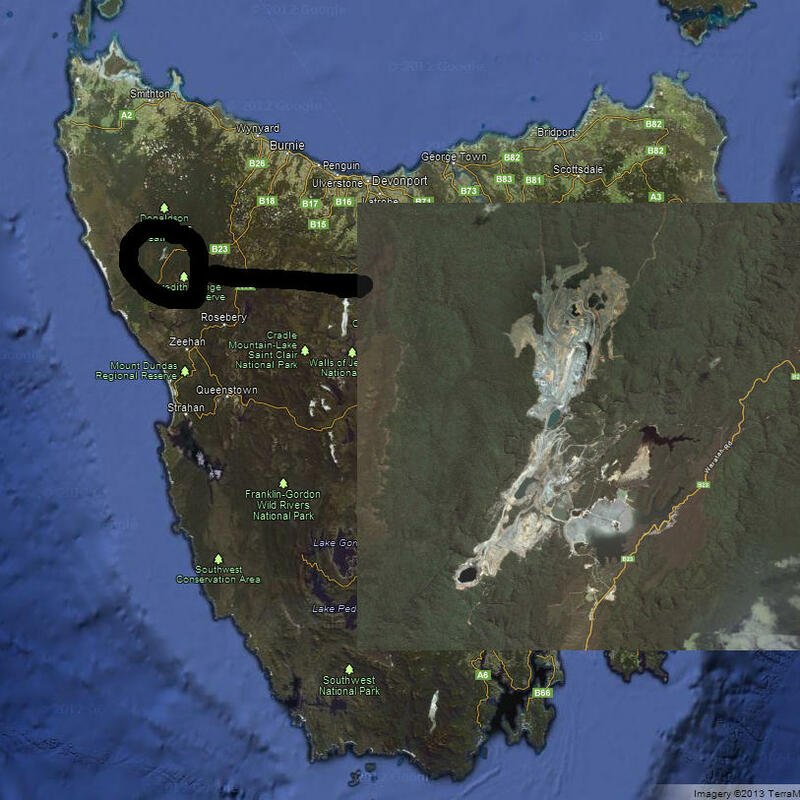 First, here's the blank Google Maps view of Tasmania. Can you see the Savage River Mine? Probably not in this shot without help, but in fact, yes you can. 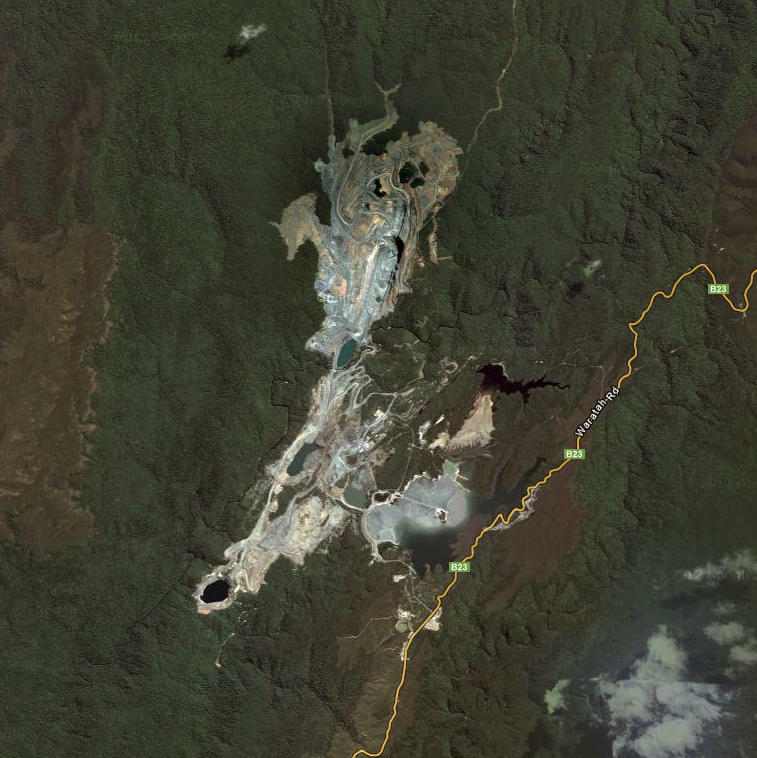 Most of the other blots on the landscape are clouds, but the one shown below is in fact the Savage River mine. See, you CAN see the Savage River Mine from space, easy! Here it is in somewhat close-up. I really hope they don't want to do this to the whole Tarkine. This mine is already there, sure. But it's not inconsequential. I don't mind a small mine, especially when they're mining really expensive stuff, like gold, and diamonds, platinum, weird rare-earths that are absolutely necessary to speed up the NBN.... No, these are mainly going to be cheapo strip mines, taking out easy "surface"* iron ore. I suspect they are incompetent fools, who will damage our environment and then nick off, leaving us with their debts, mess and damaged people. Meanwhile we, and many small businesses, will have invested heavily based on the stupid promises of people like Brenton Best and Bry-Bry the Halfwit. Oh yes, and the so-called liberal party. still be trying to attract rich, nature-focused tourists who are increasingly sceptical about our credentials as purveyors of nature and beauty. *I think they're talking about stripping only 40m of the dirt. ONLY! Sure, let's make the most of some of our best mineral resources. However, I'm pretty sure the Tarkine isn't in this category. There, we will provide a few jobs for a few years, and be left with a damaged and abandoned wasteland. There MUST be a way to identify some really worthwhile mineral deposits AND to avoid any further damage to the large areas of rainforest and coastline that have become so well known and are starting to attract so much attention from overseas. The winter of our discount tent?